Videos, examples, solutions, stories and songs to teach Grade 3 about reading and writing decimals. 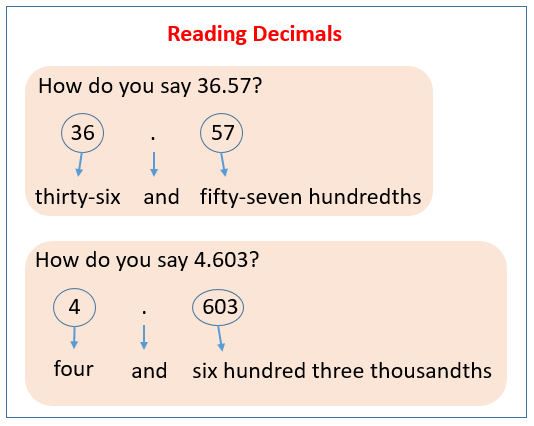 When reading decimal numbers, read the whole number part as normal, use "and" to represent the decimal point, and continue reading the number as normal, but end with the last place value. If there are no whole numbers in front of the decimal value, you do not use the word "and". Rather, you read the number as normal and end with the last place value of the number. The following examples show how to read decimals. Scroll down the page for examples and solutions. Write each written word as decimal numbers. How to read and write decimals? Tell how to read each decimal in words. 2. Write the following decimals in words.